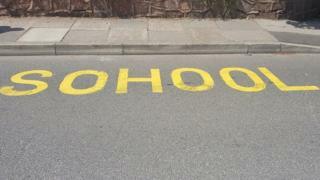 A contractor has been left red-faced after misspelling the word "school" on the road outside a primary school.Council-hired staff painted "SOHOOL" in yellow letters outside Woodslee Primary in Bromborough, Wirral.The school called the contractors back to redo the job and said teachers used it as a learning opportunity for pupils.A spokesman for Wirral Council said it trusts the worker had been given "a detention to work on his lines".The spokesman added the contractor was given "top marks" for correcting the mistake on the same day it was made. Woodslee Primary headteacher Susannah McShane said the contractors were called back to correct the "epic mistake". "What a fantastic opportunity for our learners to see that we make mistakes yet we learn from them to improve," she said. » Primary school places - not got what you wanted?